Buy medium sized hyacinth bulbs in autumn for planting outdoors - the biggest bulbs are best grown indoors. Avoid buying soft, bruised or mouldy hyacinth bulbs or which have long curling leaves growing from the top. After flowering remove hyacinth flower heads before they wilt. Continue watering the yellowing foliage - don't remove this foliage or the hyacinths may not flower the following year. Feed Hyacinths with fish, blood and bone fertilizer as soon as the flowers have faded. 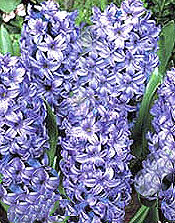 Order hyacinth bulbs from specialist growers for the best varieties. Plant hyacinth bulbs as soon as you get them into a free draining soil or in a bowl filled with bulb fibre. There are three main types of hyacinths. 1. The most popular is the Dutch hyacinth, which produces a single flower spike 4-6 inches long on a stalk 2-3 inches long. The spike is packed with bell-shaped flowers. The petals may be red, pink, white, yellow or blue, with arching petals. 2.The Roman hyacinth (early flowering) will produce two to three thinner stalks 6 inches long with fewer and more widely spaced flower blooms, in pink, white or blue. 3. The cynthella or multiflora hyacinths will produce several stalks per bulb about 6 inches long with the blooms more loosely spread on the stalks. The leaves of all three types of hyacinths are variable in length and thickness, and they surround the central flower spike. Dutch hyacinth bulbs are usually sold by size. The largest (8 inches in circumference) are for exhibition. These large hyacinths sometimes need support and that is hard to do if grown in bowls. So planting a large group of smaller ones is just as effective for most indoor displays. The Roman and multiflora hyacinths do not need support. Bulb fibre is usually made up of a mixture of peat moss , charcoal pieces, and often crushed oyster shell. Bulbs should be planted before the beginning of winter. And by planting over a period of a few weeks it is possible to have flowers for two or three months. Outside - Plant bulbs 10cm (4in) deep and spaced 8cm (3in) apart in fertile well drained soil. In a sunny or partially shaded site. It is best not to plant bulbs of different colours in the same container as these will rarely flower at the same time. For the best results, plant bulbs of roughly the same size close together, but not touching each other or the sides of the container. Place a layer of bulb fibre into the container and moisten it, then lightly firm it. Take the bulbs and press them down gently into the bulb fibre so that the tips of the bulbs are just below the level of the container rim. Then place more bulb fibre around the bulbs to within half an inch of the rim. Lightly firm down with fingertips and water well. Any container will do. Pots pans or bowls with or without drainage holes- though it is probably better without a hole. After that then keep them cool (below 50F) and in a dark place for at least 10 to 14 weeks : this ensures production of a good root system and for the hyacinth buds to appear. The commercial grower will plant hyacinths in the Autumn and bury them in six inches of peat moss until they are rooted. Instead, wrap the container in a sheet of moist newspaper or a black plastic bag and store in a cool place. It is essential to keep the growing medium (bulb fibre, peat) moist, because if allowed to dry out, fatal damage may be caused to both flower buds and roots. Only after the ten to fourteen week period of their time in the dark has taken place should the containers be moved into the light . Acclimatize them gradually by keeping them in a dim corner for a few days before placing them in full light . Keep the potting mixture moist, allowing the top half inch to dry out between waterings. Keep the hyacinths at an even temperature of 18c (65f) this suits them best until the flower bud has emerged from the neck of the bulb. Now provide bright light and some direct sunlight throughout the leaf and bud producing stages. Remember to turn them every few days so that the plants are evenly exposed to the light and do not grow one-sided. When flowering has finished, plant the bulbs outdoors. They cannot be used again as house plants. 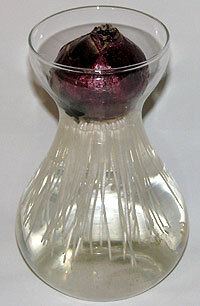 Single hyacinth bulbs are frequently planted in bulb glasses, filled with water. The bulb is placed in the neck of the glass and the water should reach to a point just below the base of the bulb. The narrow neck of the glass supports the bulb so that it remains dry while sending roots down into the water. Place in a cool dark place well ventilated until top growth is about four inches tall. After this time in the dark the glass can be put in a north window of a room and gradually introduced to more and more light . Top up with water if necessary. Water should only be added if it is at room temperature. And too much direct sunlight should be avoided.